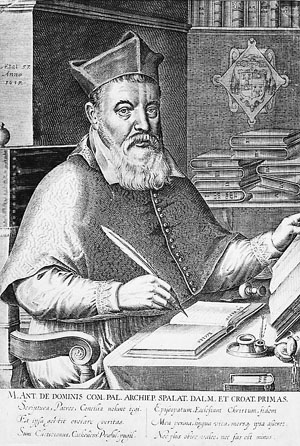 On this date in 1624, the recently-deceased body of unscrupulous Croatian prelate Marco Antonio de Dominis was burned at Rome’s Campo dei Fiori, along with all his manuscripts. Though he makes a “great men of Croatian science” list, the scientific dabblings are not what the man was chiefly known for. A caricature of Dominis made an appearance, around the time of the man’s bodily demise, in Thomas Middleton’s play A Game at Chess, as the “fat bishop” who switches sides from black to white and back. And that’s the man’s legacy, in a nutshell. Elevated to Bishop of Senj, and then Spalato, he got the Inquisition after him and raised dust for England and the Anglican church in 1616. They called you great-bellied-Doctour, made fat under Antichrist; and some there were also that sayd, that before you ranne away from the Pope, you got your owne Neece with child, and that feare to be punished for it, made you trudge away with your great load of flesh in such hast. In Albion the absconded archbishop settled into a fine tenured appointment on the king’s dole to denounce the papists like only a convert can do. As A Game at Chess would indicate, he also earned fame for his avarice and gluttony, and who knows how many other deadly sins. The rep for opportunism grew when Dominis defected back to Holy Mother Church upon the election of an old intimate as Pope Gregory XV. His well-worn welcome in England as anti-papal vituperator had, too, become complicated by the progress of the proposed Spanish Match to wed Prince Charles to Europe’s leading Catholic monarchy — an ultimately abortive project, but nearing the acme of its fortunes at the time Dominis returned to Italy. he was a malecontent knave when he fled from us, a railing knave while he lived with you, and a motley parti-coloured knave now he is come back. The Inquisition imprisoned Dominis, and his death in Castel Sant’Angelo was not sufficient to end heresy proceedings against such as he left behind. [H]is body was put into a well-pitched coffin, and that into another greater than it … until such time as the cause of the said Archbishop, still depending, should be determined by the Sacred Congregation; that according to their sentence, whatever justice did require, might be done upon him. The sentence being framed and ready to be put in execution, the said body was … taken the twentieth of this present month of December, forth from the convent where it was left, and carried to the church of Minerva, and there laid upon a table in an eminent place, together with his picture and a little sack of books which he had printed; and where it stood all the night. * Dominis is still today sometimes credited as the first to explain both primary and secondary rainbows, in preference to Descartes, who nailed them 20 years later. According to The Rainbow Bridge: Rainbows in Art, Myth, and Science, that gave far too much credit to Dominis for either originality or accuracy, and may have been written intentionally to undercut Descartes. (R.E. Ockenden made the same claim about Newton’s exaggeration in “Marco Antonio de Dominis and His Explanation of the Rainbow” in the not-exactly-current Dec. 1936 Isis). Maybe Newton explicator and Executed Today guest blogger Thomas Levenson of the Inverse Square blog could refract some light on this. ** Spalato, i.e., Split, the scenic Dalmatian city where the great Roman Emperor Diocletian famously retired to tend his cabbages. † “Lately,” Galileo sniffed, “a certain prelate has published a little tract wherein he says that the Moon, wandering through the sky, attracts and draws up toward itself a heap of water which goes along following it.” As cited in Understanding the Heavens: Thirty Centuries of Astronomical Ideas from Ancient Thinking to Modern Cosmology. it is difficult to explain his movements on this basis alone. Both in his journey to England and in his journey to Rome he took great risks, and in both cases gave up a reasonably secure position for one much less certain. Hacket, in the late seventeenth century, saw him not only as a place-seeker but as a man obsessed with an idea: “He lived and died with General Councils in his Pate, with Wind-Mills of Union to concord Rome and England, England and Rome, Germany with them both, and all other Sister-Churches with the rest, without asking leave of the Tridentine Council.” … [he] died for an ecumenical ideal which is only now, perhaps, beginning to be understood and appreciated … [and his] move [back to Rome] was the desperate attempt of a lonely, egotistical, and gifted man to find personal and spiritual fulfillment and, at the same time, to help to restore unity and coherence to a Europe being torn apart by religious conflict and war. § The Catholic Encyclopedia has Dominis re-relapsing when his pension expired along with Pope Gregory.